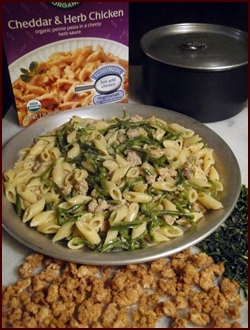 This easy Cheddar Herb Chicken Recipe combines Annie’s® Homegrown organic penne pasta and cheesy herb sauce with dehydrated ground chicken and French-cut green beans. Listed Ingredients- organic pasta, organic cheddar cheese, organic whey, organic tomato powder, organic nonfat milk, salt, organic corn starch, organic onion powder, organic garlic powder, disodium phosphate, organic spice, organic parsley, yeast extract. For this recipe, divide the contents of the box into four parts. Pack sauce mix and powdered milk in a 2 x 3 plastic bag. Enclose with other ingredients in a 4 x 6 plastic bag. Dehydrate ground chicken the same way as ground beef. Add bread crumbs before cooking and dehydrating to make it tender in your meal. Alternatively, dry canned chicken. (My preference now). See dehydrating meat and dehydrating vegetables. Sources to purchase dried meat and vegetables. Place all ingredients except cheddar herb sauce mix and powdered milk in pot with water and soak five minutes. Light stove, bring to boil, and continue cooking for another two minutes. If you have plenty of fuel, three minutes of boiling wouldn't hurt since the noodles are thicker than other boxed noodle products. Remove pot from stove, stir in sauce mix and powdered milk, replace lid, and place pot in insulating cozy for ten minutes. Sauce thickens as it cools. Copyright ©2008 – 2019 Chef Glenn at BackpackingChef.com. All rights reserved.